A novel technique that nudges single atoms to switch places within an atomically thin material could bring scientists another step closer to realizing theoretical physicist Richard Feynman's vision of building tiny machines from the atom up. A significant push to develop materials that harness the quantum nature of atoms is driving the need for methods to build atomically precise electronics and sensors. 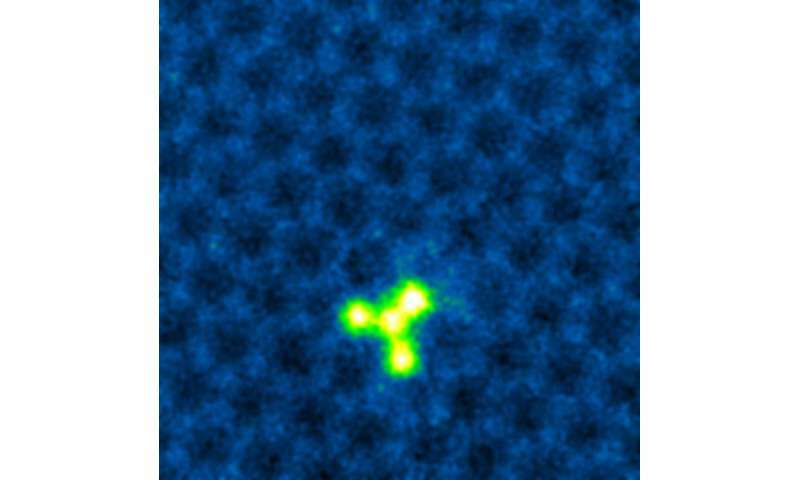 Fabricating nanoscale devices atom by atom requires delicacy and precision, which has been demonstrated by a microscopy team at the Department of Energy's Oak Ridge National Laboratory. They used a scanning transmission electron microscope, or STEM, at the lab's Center for Nanophase Materials Sciences to introduce silicon atoms into a single-atom-thick sheet of graphene. As the electron beam scans across the material, its energy slightly disrupts the graphene's molecular structure and creates room for a nearby silicon atom to swap places with a carbon atom. "We observed an electron beam-assisted chemical reaction induced at a single atom and chemical bond level, and each step has been captured by the microscope, which is rare," said ORNL's Ondrej Dyck, co-author of a study published in the journal Small that details the STEM demonstration. Using this process, the scientists were further able to bring two, three and four silicon atoms together to build clusters and make them rotate within the graphene layer. Graphene is a two-dimensional, or 2-D, layer of carbon atoms that exhibits unprecedented strength and high electrical conductivity. Dyck said he selected graphene for this work, because "it is robust against a 60-kilovolt electron beam." "We can look at graphene for long periods of time without hurting the sample, compared with other 2-D materials such as transition metal dichalcogenide monolayers, which tend to fall apart more easily under the electron beam," he added. STEM has emerged in recent years as a viable tool for manipulating atoms in materials while preserving the sample's stability. Dyck and ORNL colleagues Sergei Kalinin, Albina Borisevich and Stephen Jesse are among few scientists learning to control the movement of single atoms in 2-D materials using the STEM. Their work supports an ORNL-led initiative coined The Atomic Forge, which encourages the microscopy community to reimagine STEM as a method to build materials from scratch. The fields of nanoscience and nanotechnology have experienced explosive growth in recent years. One of the earlier steps toward Feynman's idea of building tiny machines atom by atom—a follow-on from his original theory of atomic manipulation first presented during his famous 1959 lecture—was seeded by the work of IBM fellow Donald Eigler. He had shown the manipulation of atoms using a scanning tunneling microscope. "For decades, Eigler's method was the only technology to manipulate atoms one by one. Now, we have demonstrated a second approach with an electron beam in the STEM," said Kalinin, director of the ORNL Institute for Functional Imaging of Materials. He and Jesse initiated research with the electron beam about four years ago. "Phosphorus has potential because it contains one extra electron compared to carbon," Dyck said. "This would be ideal for building a quantum bit, or qubit, which is the basis for quantum-based devices." Their goal is to eventually build a device prototype in the STEM. Dyck cautioned that while building a qubit from phosphorus-doped graphene is on the horizon, how the material would behave at ambient temperatures—outside of the STEM or a cryogenic environment—remains unknown. "We have found that exposing the silicon-doped graphene to the outside world does impact the structures," he said. They will continue to experiment with ways to keep the material stable in non-laboratory environments, which is important to the future success of STEM-built atomically precise structures. "By controlling matter at the atomic scale, we are going to bring the power and mystery of quantum physics to real-world devices," Jesse said. We can't build houses, cars, and space rockets atom-by-atom; but, we can build quantum computers!